MIAMI, Dec 7, 2011/ FW/ — Just in time for the holidays and aptly entitled for the season, Donald J Pliner launches “IT’S THE MOST WONDERFUL TIME OF THE YEAR…FOR SHOES” social media sweepstakes. The luxury footwear and accessories brand will be hosting a social contest that will be open for submissions beginning December 6, 2011 through December 23, 2011. Contestants should visit http://bit.ly/ul32Q3 and enter their submissions for why they believe it’s the most wonderful time of the year for shoes. Winners will be selected at random every Friday of the week and announced on the Donald J Pliner Facebook page. 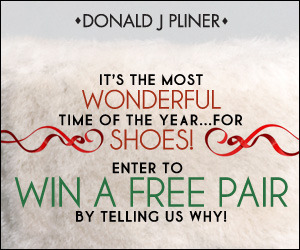 Winners will receive one free pair of Donald J Pliner or Lisa for Donald J Pliner shoes. Shoe selection will be guided by Donald J Pliner shoe designers. For an opportunity to submit an entry for your chance to win, please visit http://bit.ly/ul32Q3 .